The most successful of the Northwest Territories’ ‘free-traders’ – individuals or businesses that challenged the trading monopoly of the Hudson’s Bay Company – was the Hislop and Nagle Trading Company. In 1893, Jim Hislop and Ed Nagle, using money saved from working for the Hudson’s Bay Company, put together a boatload of trade goods and took it north to the Slave River delta. There they set up a trading post near Fort Resolution. It was the perfect location for planning the establishment of a new trading post near the Hudson’s Bay Company post at Fort Rae (map)(now Old Fort Rae), the focal point of the trade in muskox hides. 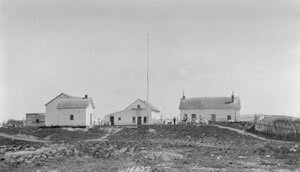 At that time Fort Rae was located on an island in the North Arm of Great Slave Lake about 25 kilometres southeast of the present location of Rae. Jim Hislop and Ed Nagle decided to set up a trading post on Marian Lake near the head of Frank Channel. This eventually became the new location of the community of Rae. The Hislop and Nagle Trading Company was able, at this location, to not only give a better price for muskox hides but also offered better prices and better selection for their trade goods. This Company did very well at Rae and expanded into other areas of the Northwest Territories and had, at its peak, fourteen permanent trading posts in the north. In 1910 Jim Hislop and Ed Nagle sold their fur trade company to a consortium of traders who renamed it the Northern Trading Company.